Fighting and preventing animal cruelty in the US. Rescuing animals from dog fighting, hoarding, puppy mills and natural disasters. Promoting spay/neuter and adoption for dogs, cats and horses. Advocating for stronger laws to protect pets and farm animals. For over 150 years, the American Society for the Prevention of Cruelty to Animals (ASPCA) has been committed to rescuing, protecting and placing vulnerable animals throughout the entire United States. 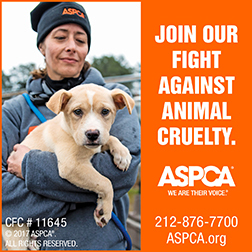 Each year, the ASPCA helps rescue thousands of animals from dangerous situations, assists in cruelty investigations and fights for stronger animal protections under the law. Buddy, was one of 367 dogs rescued from the second-largest dog fighting case in U.S. history. At just 10 weeks old, he was destined to spend his life on a chain, being groomed to fight. With the help of the ASPCA, Buddy was rescued and given a second chance at life. Buddy's story is just one of thousands of happy tails the ASPCA makes possible year after year, with the help of our generous supporters.